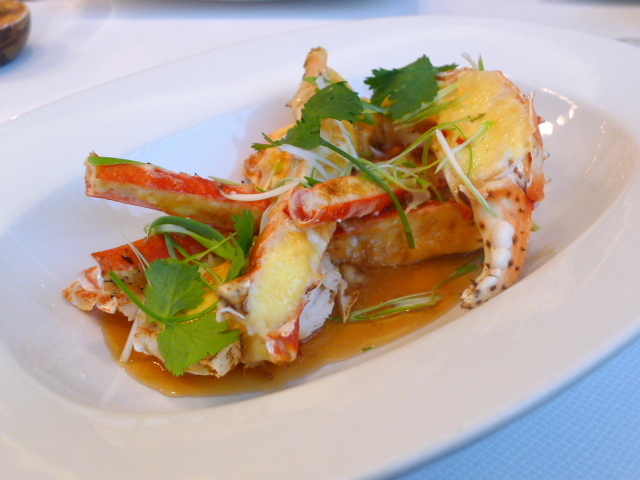 Wild Norwegian red king crab legs (£28) can be served three ways: on ice with mayonnaise and lemon, grilled with basil tomato olive oil and citrus vierge or what I ended up having which was served warm with a sweet chilli-ginger sauce. The crab was delightful, beautifully cooked and moist. The chilli-ginger sauce was also a winner and was perfectly balanced for sweetness and it worked really well with the crab. The menu did state that the crab was served warm, but the crab would have probably worked better hot. 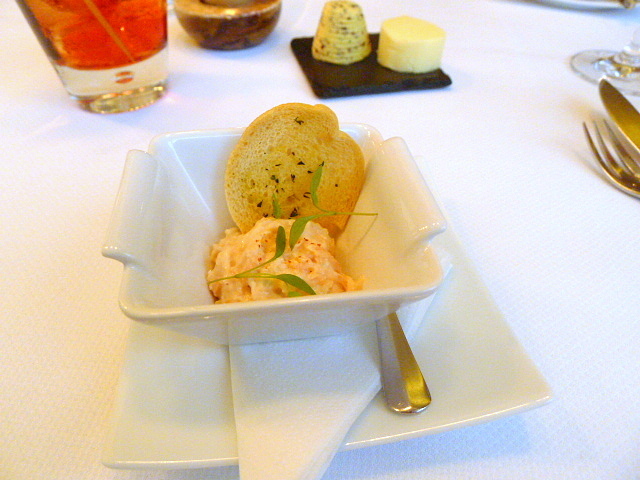 Apart from that, the crab was very enjoyable although extraordinarily messy to eat as it was in the shell. 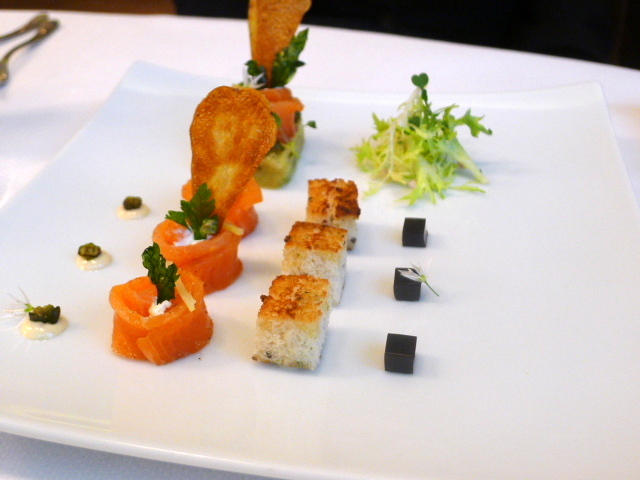 Scottish oak smoked salmon (£20) was sweet with a nice smoky flavour and prettily presented. The accompanying balsamic jelly was well made and gave the dish much needed acidity, as did the lovely wild garlic-caper butter. The salmon sat perched on some crushed Jersey new potatoes that were tasty, but could have done more herbs running through them for a greater fragrance. Wild Cornwall seabass fillet (£30) had been beautifully cooked in basil oil to retain maximum moisture. The distinctive aroma of the basil elevated the sweetness of the fish. The light creamy texture of the Barigoule sauce was magical with the fish, and the accompanying fennel compote, artichokes poivrade, ratatouille and olive tapenade were all well-made and balanced the dish out nicely. However, the mixed ocean fish grill (£28) was a little bit disappointing. Consisting of fillets of salmon, halibut, tuna and sea bream, (left to right), the halibut was the best of the lot for it was delicious and moist. 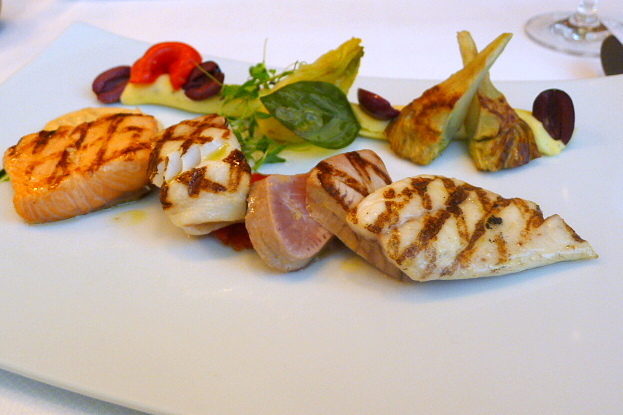 But the other fish let the dish down with the salmon being slightly questionable in freshness; the tuna bland, albeit cooked to a lovely medium pink; and the sea bream a touch dry. The lobster bearnaise sauce with its tiny pieces of sweet lobster meat was glorious, and it helped to bring flavour to the dish. The accompanying artichoke and fennel were a tad over and slightly soft to the touch. 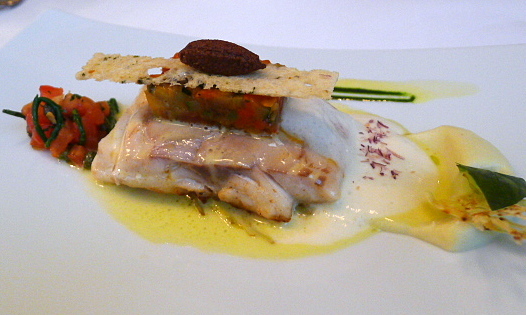 Having tasted the deliciousness of the seabass, this dish was inferior by comparison. 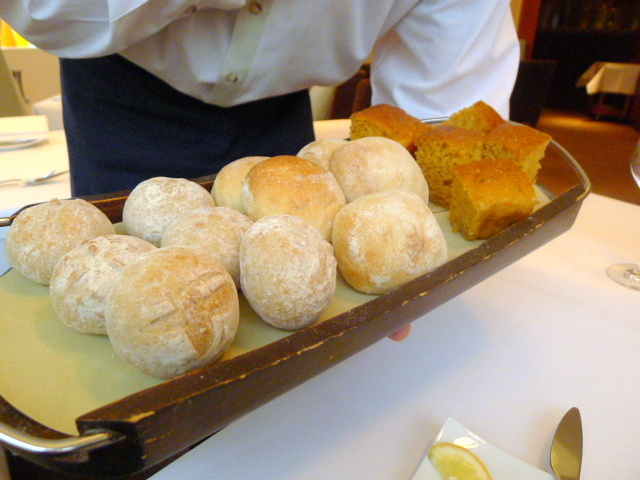 The breads were average in both taste and texture and consisted of white, brown and a tomato focaccia. But they were worth a mention as they came with some seaweed and salted butters, with the former being quite delicious from the seaweed. British strawberries Meli Melo (£9.50) were sweet and ripe and came with a chilled champagne sabayon that was light and delicate in texture, and beautifully creamy in taste. 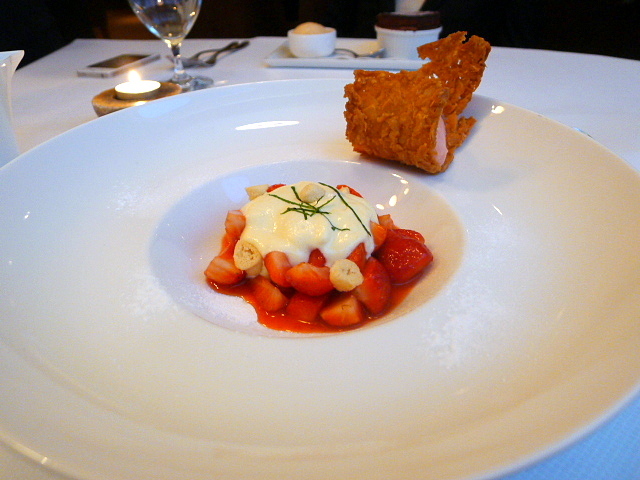 Accompanying the dessert was a four fruit sorbet perched inside an almond tuile. The sorbet was quite sharp and worked against the strawberries rather than with it. 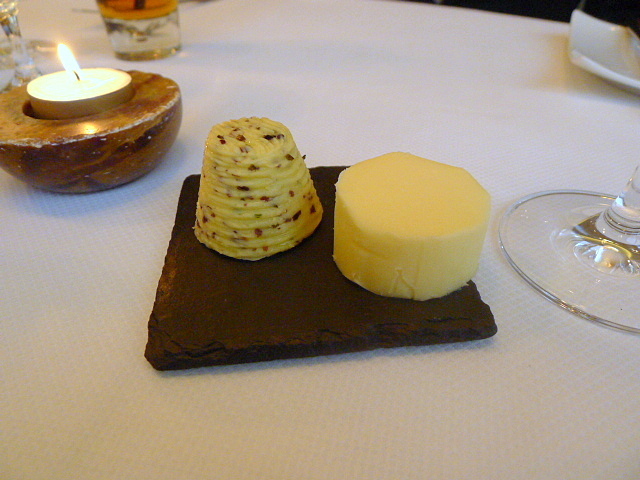 The tuile was tasty, but technically it was too thick and lacked for a buttery aftertaste. 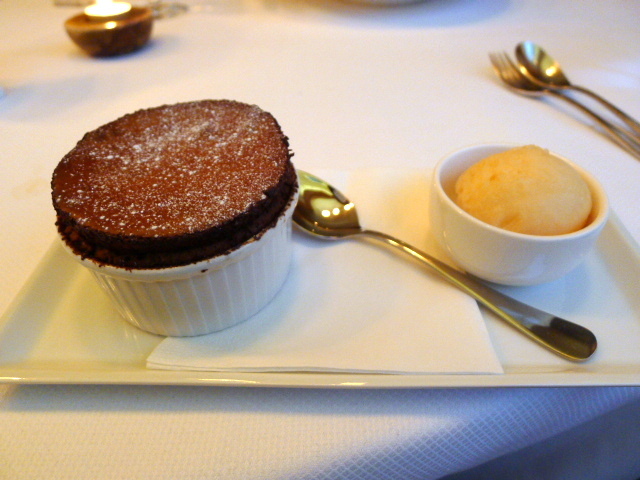 A valrhona manjari soufflé (£9.50) was expertly made. It had risen nicely, had a good taste of chocolate and was light and fluffy on the inside. It came with a pink grapefruit and rosemary sorbet that was quite strong from the rosemary. This was perhaps not the best pairing for the soufflé, but some crème anglais also came out with the dessert and was divine. The service at One-O-One was excellent. It was attentive, thoughtful and considered without being overbearing. Despite my reservations about the ocean fish dish, there was great skill shown by Chef Pascal Proyart throughout the meal to warrant a repeat visit to One-O-One. Prices listed on the a la carte menu are high, but with a 40% discount, the food was incredibly reasonable and great value for the quality and standard of the cooking. Price range: £49 to £77 for three courses, excludes drinks and service. But look for an offer through TopTable.